Waterway Palms Plantation brings Charleston charm to a quiet luxury Myrtle Beach community, with the Intracoastal Waterway adding the perfect extra touch to a perfect neighborhood. 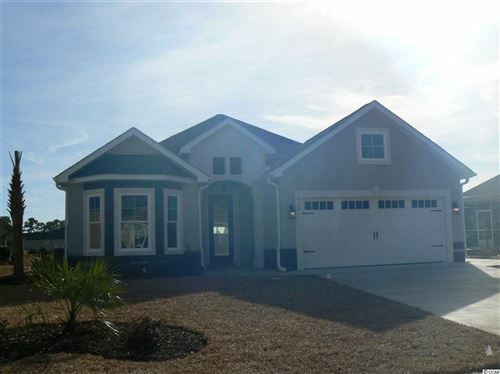 The homes in Waterway Palms Plantation are custom, but must be of two styles. The "Charlestons" are styled after the colorful Charleston row houses - narrow, with 2 or 3 stories, blooming courtyards, wrought-iron railings, and trellis-covered balconies. The second style is called "Low Country." Low Country homes are wider, 1 or 2 stories tall, and equally elegant. The homes all have southern-style porches to sit and sip your mint julep when you aren't playing down at the docks with your boat. In the winter, when temperatures are the 50-60 degree range, you can sit by a beautiful fireplace and dream of the coming summer days in the sun. The neighborhood features a $5 million "plantation" clubhouse situated on a large lake. It boasts a swimming pool, tennis courts, and children's playground. The Waterway Palms Plantation community also offers gated, secured boat storage, and private dual boat launching facilities. Beautiful gazebos are scattered throughout while amenities are located in the center of the development, making it an easy walk, golf-cart, or bike ride to enjoy them. There is even a bridge for the homes on the other side of the lake! As the #1 selling real estate agency on the Grand Strand, RE/MAX Southern Shores agents are experts when it comes to knowing where the best properties and best buys are along the Intracoastal Waterway. If you're looking for one of the finest communities in which to build or design your dream home, it doesn't get any better than Waterway Palms. Contact RE/MAX Southern Shores at 843-249-5555 for more information about these beautiful waterway lots and homes in Carolina Forest. Waterway Palms Plantation is one of the newest waterway developments available at this time. So, you can have your choice of location and home style by buying early. There is no time limit to build, although there are minimum requirements of square footage to maintain the luxury look of the community. Welcome to the search page for RE/MAX Southern Shores where you can find a highly qualified and trained real estate agent! On this page you can input your specific needs to search Waterway Palms Plantation or all of Myrtle Beach, South Carolina real estate to find the perfect property for YOU. Use the form on this page to access listings at Waterway Palms or choose one of the links to learn more about other Grand Strand communities. RE/MAX Southern Shores agents sell both residential homes and building-ready lots in this quiet section of the Waterway where newly constructed houses dot the bluff. Please contact our office at 843-249-5555 where RE/MAX Southern Shores agents are available every day to assist with all your real estate needs. We’ll help you navigate the touring, selection, negotiation, and purchase process for the property that is perfect for YOU! Waterway Palms Plantation is truly a one-of-a-kind neighborhood fit for a king, so be sure to tour the available lots and homes with a RE/MAX Southern Shores agent when you are looking for a luxury waterway home in Myrtle Beach!